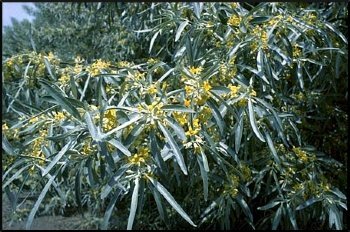 RUSSIAN OLIVE - a dense, low branched, large shrub or small tree reaching 25 feet in height on favorable sites, native to Eurasia. Silver colored persistent fruit is an important winter food for game birds. Tolerant of alkaline and dry soils.